About Families, Inc. is a 501(c)3 non-profit serving the Coachella Valley Community. 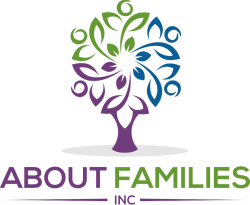 About Families Inc. is a 501(c)3 non-profit organization committed to strenghtening the Coachella Valley community by serving local families from the prenatal period through the first 5 years. "This is a fabulous organization! The breastfeeding clinic, prenatal yoga, and new moms support group are invaluable to new parents. They have wonderful classes available for parents and Joanna and Jeni are so amazing." "About Families pulled me out of the darkness after I had my first baby. I was scared to leave the house for the first three months. After going to a few breastfeeding clinics I joined the Mama Support Group that met once a week. I said to myself it's only once a week, I can do that. By making the commitment to go once a week I was able to gain back my confidence. I no longer felt alone in my struggles because there were other moms in the trenches with me." "My four year old, Cael, attends Mariposa Parent-Child Workshop. It is a wonderful place for kids to learn and experience a fun, school environment! Since Cael started his speech has greatly improved, The interaction with other kids and volunteering parents builds community and helps develop their young, curious, growing minds. I would recommend Mariposa to anyone wanting a fun, safe, and learning experience for their little ones."